Jackie Bird presents a special round-up of all the best bits from Friday night's Children in Need extravaganza, with a look at how the charity supports young people in Scotland. Browse content similar to Scotland's Best Bits. Check below for episodes and series from the same categories and more! helps children all across the UK. supports projects all over Scotland. got cancer in May this year. through this, it will be easy. it was clear he was seriously ill.
A lovely day for the sailing. a good one, I think. It's a seal of approval! well well and clear. Over. actually feel a sense of freedom. time for all of us. Benny's best pal on board. good to see this and it's all great. few familiar faces along the way. visiting the nation's River City. to go missing or aWal on my watch. you, big man. Doing your nose on us? been in trouble with the police. Aye, and I'm Kim Kardashian! I'm sure I've met her. the telly with this bad boy. working with PC Hugh McArdle. She's not your pal, pal. gents. Bobby, we talked about this. you really need to go home now. OK.
get some practice in here. of speed up on that one. beat you two in a race. will race you and officer Karen. I'm begging you, please do this? the dinners on the way. I need this. Please, let's have some fun? I don't deploy this card lightly. race then. We'll be back. Angus. I don't like him. # Somewhere Over The Rainbow. get to practise it and get it right. Get the birds fly I over. are singing it all the time. trying to teach him sing language. bounds. He's just loving it. to sign some of it? raise money for Children in Need! hard work is paying off. and signing Over The Rainbow. # Why, then, oh why can't I? one. The rickshaw is down. cycle to Scotland is a return home. Poland, when I was nine my dad died. like this while I still can. made it to Scotland! Over you go! this? Describe it to me. and got through all those miles. challenge me. And that's what I got. miss you all, I really well. Rickshaw Riders, we salute you! needs simply to have some fun. in his eye but that went. but sometimes you do have to laugh. he is angry and upset. Gemma began losing her confidence. is lonely. Especially at first. lying and you don't know what to do. at our door very unsure and anxious. sensory room and the playroom. his voice again -- provide harried. When he arrived he was non-verbal. You need to stand here. because we have been part of that. to come back into our world. their very own Rickshaw Challenge. games. I was the Chieftan? never forget a face. Or a smile. to lay down the law. force is resting on your shoulders. Do not let me down. secure the perimeter. What's that? lives to looking after loved ones. five years old now. Aren't you baby? stuff. And it's cute. Yeah. to be cared for 24 hours a day. the most part, it's pretty full-on. kitchen. Getting his meals set up. The days can be really, really hard. to help with all that. entertain him while her mum's busy. # You know that I'm still standing. went into a 20-hour seizure attack. worried at night-time or at school. it called? Maybe like pass away. the little girl she wants to be. happy I'm not the only person. this and get that time away. Need single Fields of Gold. # Will you stay with me? # Among the fields of barley? with me. Doing stuff in the garage. had a stomach ache, feeling sick. and a place with happy memories. the one who took all the photos. dad proved too much for him. bed. That's how bad it was. get through it. He just disappeared. helps young people in distress. and make a real connection. myself down and get less stress. last year, he has changed immensely. he has, he is an absolute treasure. Doddy, back to being Doddy again. club to day trips in the holidays. of pride in young people. 17 and he is paying back. helpful, and with my family. anybody know what that is? you can develop as a young person. has not stopped him dancing. be part of the company. Dylan is giving something back. them that sense of control as well. support group for two years. I was the same as them. and you wouldn't be you without it. youth club since he was eight. brain, it affects my head. have to go to hospital and stuff. come out of himself again. haven't! Eddie has given loads back. they get on the bus. Children in Need funded projects. That's almost it from us this year. # Nothing but blue skies. # I can see all obstacles in my way. 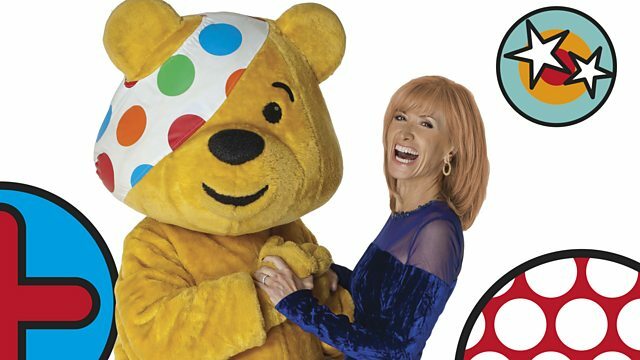 Jackie Bird presents a special round-up of all the best bits from Friday night's Children in Need extravaganza plus an extended look at how the charity supports young people in Scotland. Through a series of short films we meet some of the children whose lives have been changed by Children in Need's diverse range of projects all across Scotland. There's also another chance to see the performance from this year's Scottish Children in Need Choir, led by Choir Master Andrew Panton and made up of 125 young people aged between 8 and 15 from schools across Ayrshire performing a special version of Over the Rainbow and an exclusive rousing performance of Johnny Nash's I Can See Clearly Now. Jackie also looks back at the moment One Show presenter Matt Baker and his Rickshaw Challenge team - including Scottish riders Greg, 18, and 17-year-old Shona - arrived at BBC Scotland on Friday night at the end of their epic 500-mile 'Ride to the Clyde' from London. Stars from River City and Scot Squad also get in on the act with an exclusive mash-up sketch filmed especially for Children in Need.